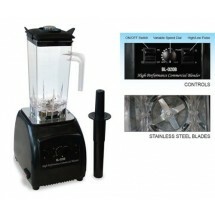 A commercial blender is very important for most restaurant bars and sometimes even as kitchen equipment. The right blender for a venue will depend on the amount it relies on its commercial blender, as well as its budget and ambience. Ice cream shops, for example, tend to sell a lot of milkshakes, making it important for them to have high power, heavy duty blenders. Since ice cream shops usually offer quick service and are expected to have high traffic and noise, the noise of the commercial blender will not be a relevant factor in choosing the right blender. Sophisticated bars, on the other hand, will need a heavy duty blender for smoothies, margaritas, and other frozen drinks, but noise will have a negative impact on the ambience in the venue, making a low noise commercial blender necessary. Luckily for venues, there are blenders on the market to match every need, providing solutions for the restaurant kitchen and front-of-the-house service. Comments This heavy-duty blender may be the best blender for smoothies, margaritas, and milk shakes in venues that serve a lot of blended drinks. A restaurant kitchen that relies on a commercial blender to blend sauces and soups can also benefit from a high-power blender. The stainless steel container may be a drawback for some venues since cooks and barmen will not be able to see the contents of the blender to make sure they have reached target consistency. In high class venues, a commercial blender needs to be more than just strong. It must also be quiet, so as not to disturb the ambience of the venue. This blender is a great option for front-of-the-house restaurant equipment in venues looking to minimize noise from food preparation. 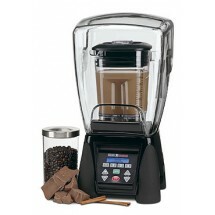 This blender is large and very affordable compared to some of the other options presented in this blender comparison. However, it has less power and a lower warranty than the other models. 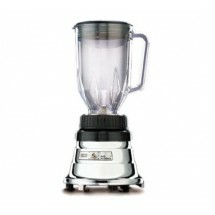 In terms of blender comparison, this blender scores relatively low in terms of power and special features. 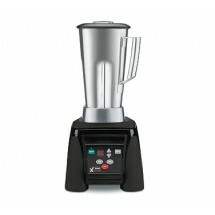 However, the warranty and affordability make this blender a great option for restaurant kitchens or restaurant bars in venues that don’t use blenders heavily on a regular basis.